The two search marketing companies share how they helped Avery remove competitors from their valuable branded searches, resulting in lowered CPCs, increased clicks, and a 51% drop in brand campaign costs to be reinvested. Removing unauthorized brand bidders lowered costs by 51%. 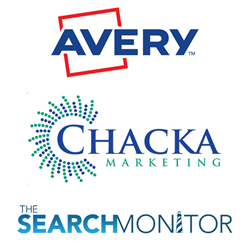 Chacka Marketing, a leading digital marketing agency, and The Search Monitor, a leading ad intelligence platform, today released a case study on how their brand protection efforts increased clicks and lowered costs for Avery’s branded search campaigns. Chacka’s solution was to use The Search Monitor’s ad monitoring platform to catch competitors’ use of Avery’s trademark in their ad copy, a clear violation of the search engines’ policies. The monitoring service provided the proof needed to report the violations, including daily reports with the names of the violators, details of their ad copy, time and date of each violation, screenshots, and destination URLs. Chacka’s company officials reported that despite these efforts, one particular competitor kept showing up week after week in their reports, and it took a Cease and Desist letter to finally get the competitor to comply. Company officials added that the reduction in brand CPCs saved Avery thousands of dollars a year and are being reinvested to drive more awareness, qualified site traffic, and ultimately sales for Avery. To learn more about the Avery brand protection case study, please visit ChackaMarketing.com and TheSearchMonitor.com. The Search Monitor captures advertising activity on paid search, organic search, social media, mobile search, and shopping engines worldwide for brand and affiliate compliance, and competitive intelligence. Interactive agencies, search marketers, and affiliate marketers use The Search Monitor to gather and analyze competitive information more effectively. To learn more, please visit TheSearchMonitor.com.